The code will be available every Tuesday at 12:00 a.m (EST) on all 4 hostesses blogs. 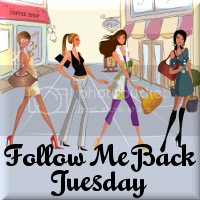 Click the button for more information and to join Follow Me Back Tuesday! I'm joining you from FMBT! Hope You can buzz over to my blog soon! Hi, I'm following you! Happpy Tuesday!